Our launch base has already been attacked last February. Fortunately, during the epic MGC 2012 battle, our valorous steel defenders have successfully thwarted our enemies' attacks. Hence, the following launch of our RGC-2K12 rocket was flawless, and it is right now traveling in the Pixellated Way towards the Retro Moon. We must now closely monitor its trajectory, and to that end the Retro-Gaming Connexion organization has established a command center. To maximize our chances of success, we offer our cherished 80s-90s-era gaming computers the opportunity of joining our AC-2K12 base on April 14th and 15th, in order to be involved in the control of this space-time travel, in a friendly and festive atmosphere. As usual and since 2006, there will be numerous specific sections. We will turn this trip into an unprecedented adventure with the help of Acorn, Commodore, Amstrad, Atari, MSX, Sinclair, Oric, Thomson and other brand machines. The operation will take place from 10 AM on April 14th (Saturday) to 4 PM on April 15th (Sunday) in the Congis-sur-Thérouanne salle des fêtes (entertainment center). - Four-player Medieval Mayhem tournament on the Atari 2600. - Freeplay areas with numerous machines available. - A sales/trading area for everyone. As such an ambitious operation requires meticulous preparation, this convention is exclusively registration-based. Entry fees : €11 for Saturday only - €9 for Sunday only - €17 for both days ; women and children under 12 are entitled to a 50% rebate. If you would like to attend (with or without bringing your own hardware), please use the online registration form below to tell us about your need and wishes. For any question, do not hesitate to contact us directly, either on the forum or by e-mail. Thanks in advance and see you at the AC 2012! Registering for the AC 2012 must be done through our online form. Your registration will be confirmed on the reception of your payment (by check, Paypal or credit card - contact us for any other payment means). All practical information (packages, maps, train schedules, etc.) are available on our website ; more specific information (carpooling options, sales reservations, etc.) can be found in our forum. We encourage you to register and tell us about any particular demand you may have (projects, specific hardware you would like to present...) as soon as possible ; this will help us in making the best possible organizing. For any extra information or question, use the AC forum: http://www.yaronet.com/sujets.php?f=801. Originally known as the Jaguar Connexion and launched in 2002, the convention was initially just a gathering of a handful of Atari enthusiasts. Five editions later, it became the AC, to include all machines - consoles and computers - of the wide-known brand. Users, collectors, and other interested people now gathered during a yearly event. In the following years, the AC has been including other brands to offer the attendants an always unique experience. Founded in 2004 by six retrogaming enthusiasts with diverse abilities and origins (consultant, multimedia teacher, pool technician), this non-profit organization's goal has always been to promote human gatherings. 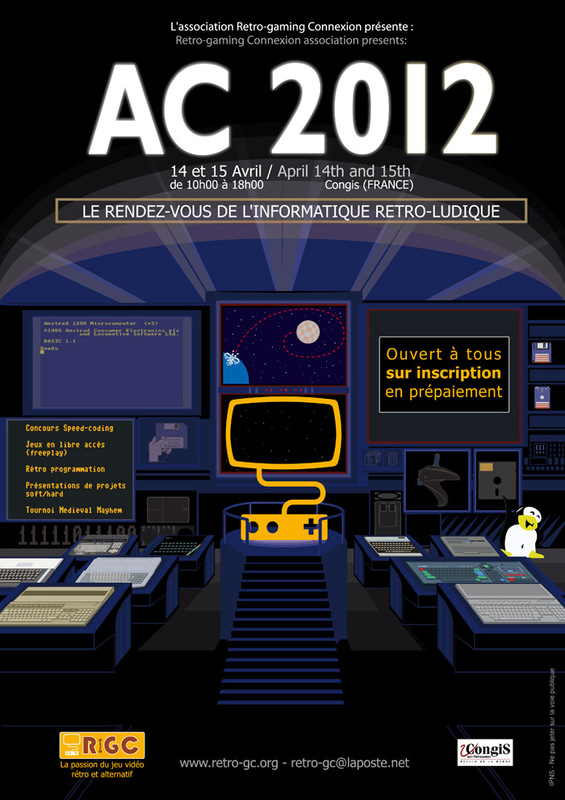 The successful conventions of the past years have turned the RGC organization into a well-known retrogaming partner in France. Today, with its strong membership of 11 persons, the organization has acquired a wide range of competencies, ranging from holding conventions (AC and RGC) to offering weekly computer training sessions, from packaging design to videogames production.